The RYOBI Plaster Repair Starter Kit is a new, innovative way to repair drywall easily without calling a professional or investing in an abundance of supplies. Get the job done in less than half the time of a traditional repair with RYOBI's three-step process! Wall repair with the RYOBI Plaster Repair Starter Kit is completed in 3 Easy Steps: 1.) 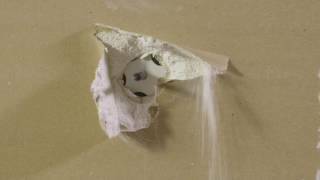 Cover the hole with the template, pressing adhesive firmly to the remaining drywall. 2.) Using your drill, drill the hole saw into the drywall, using the template as a guide. Drill until the hole saw is flush to the wall. The hole saw will remain in drywall as the plug. 3.) Fill over the hole saw, then sand and paint the area to complete the drywall repair. Repairs holes in plaster up to 4 inches wide, in 3 easy steps: Cover, Drill, Fill. Plug ensures surface is perfectly flat to apply filler. Removes the need for investing in an abundance of supplies to repair a small hole. Eg. No more buying large pieces of Gyprockfrom Bunnings to repair just a small hole, no more screws, cutting tools etc.